The Catskills’ booming craft beverage market has birthed a new hangout in a very old building in Woodstock. 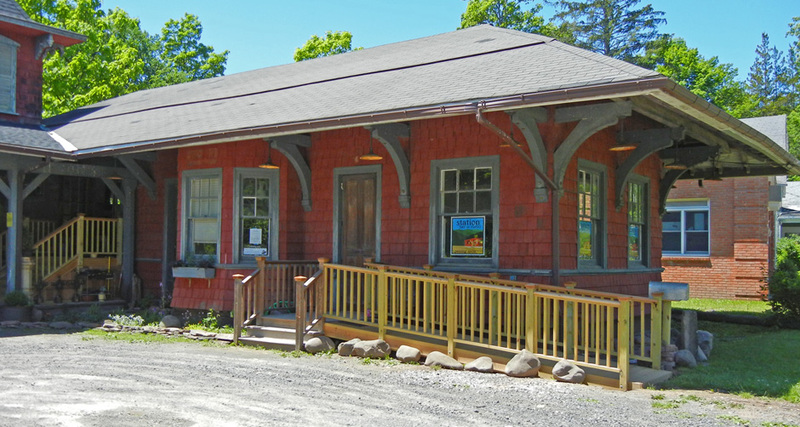 After serving the Delaware and Ulster Railroad in two different locations until 1954, the 116-year-old train station was moved to Woodstock in 1970, where it’s now poised for a new purpose. Set to open by the end of this month on Tinker Street just west of the Village Green, Station Bar & Curio will showcase the breweries and distilleries that call the Catskills home. “We want to be a nice little community spot,” said co-owner Lily Rollins, who lives in Fleischmanns with husband and partner Ben and their 16-month-old son, Theo. With a third partner, Mark Landsman, the couple has created a rambling but cozy space, repurposing a treasure trove of auction and estate sale finds for modern uses. An antique radiator has been refabricated into a tap head. Vintage Catskills memorabilia like posters and serving ware dots every wall.There’s a pool table and a Pac-Man arcade game. Catskills beer and cider and cocktails built around local spirits are the heart of the new venture. There will be eight drafts on tap, including at least one cider. The partners are working with producers like Livingston Manor’s Catskill Brewery, Arkville’s Union Grove Distillery and Bethel’s Catskill Distilling Co. to develop their beverage menu, Lily Rollins said. The wine list includes whites from the Finger Lakes region and other offerings from further afield. The bar seats about 30 inside, in a collection of bar stools, deep booths and small tables scattered across several separate rooms. There’s room for another 30 patrons on the expansive covered deck. Station Bar & Curio does not have a full restaurant kitchen, but there will be a small selection of sandwiches, soups and salads on the menu as well. Grilled cheese, gazpacho and a red cabbage and sugar snap pea salad are currently in the works. Find Station Bar & Curio at 101 Tinker St. in Woodstock. It is scheduled to open by the end of June; check the bar’s Facebook page for updates. Tentative hours are noon to 2 a.m. daily.